This dessert is made like a tiramisu but reminds me more of a trifle. It is a beautiful combination of flavours and is the perfect summer dessert. The raspberry sauce could be left out but I think it gives the dessert something special. You can choose to make this in a cake tin like I did but you have to make sure it is well set before removing it from the tin. A spring form or loose-bottom tin works best so it is easier to remove. I would recommend putting it in the freezer for about 20mins before taking it out of the tin so it is firm. An alternative would be to serve it in a trifle bowl. Line the base of a spring-form cake tin (about 20-22cm) with baking paper. Fold the egg whites lightly in to the cream mixture. Meanwhile, make the raspberry sauce by placing the sugar and 2 tablespoons of water in a saucepan over medium heat until sugar has dissolved. Cool slightly, then add the berries and lemon juice. Whiz in a food processor until smooth, then pass through a sieve. Chill until ready to serve. (You can keep the sauce, covered, in the fridge for 3-4 days). Start the formation process. Dip half of the ladyfingers in to the orange juice mixture and drain well. Layer on the bottom of the tin. Spread over one third of the marscapone mixture and smooth out. Top with one third of mango slices (reserve one third for decoration). Repeat process again ending with a creamy layer. Cover with clingwrap and put in the fridge for at least 2hours to set. 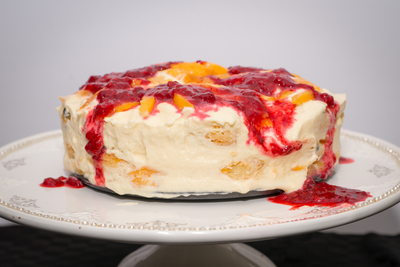 Before serving, place mangomisu in the freezer for 20minutes to harden before removing from the cake tin. Gently remove from tin and place on serving plate. 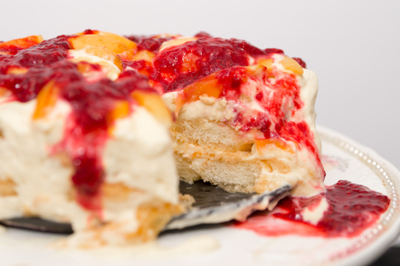 Pour raspberry sauce over and voila, you have your beautiful dessert!